Hi.Just purchased a 1 year old R100XR, to replace mt R1200GSA. Wanted to be a hooligan again, for a while anyway. Very impressed. One or two niggly little things I would like to discuss with with other owners, before stomping back into the dealers. Look forward to chatting. Hi there and welcome. 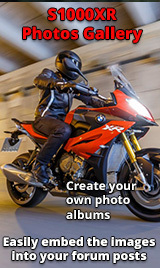 is that the same as an S1000XR, or am I missing something here? what is it you wanted to discuss? Probably the fact that his bike has an R100XR sticker on it! Been indoctrinated with R for several years. I addressed this in another post, mainly 'Hunting' at between 1000 and 3000 causing rough running. Have since had the dealer look at it, they said its normal. Tried there courtesy bike and it was worse than mine. Must be trait of the engine. Other was screen types for more protection gain in another post.